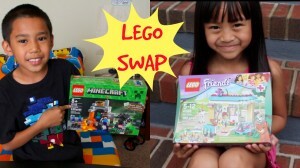 My eldest daughter Emelyn (TeamYniguez) did a LEGO SWAP video with my friend Kat’s eldest son, Isaiah (IJKFamTV). Emelyn and Isaiah have been pen pals for the past year and finally met in person when we went to Las Vegas for vacay last month, where they exchanged their lego gifts in person. We didn’t have time to film together as planned but we though it would still be fun to do the video separately! Make sure to check out Isaiah’s video to see what Emelyn picked for him and how he built his Lego set!